Shogun Warriors # 5 starts with a splash page that is truly worthy of being a splash page. It’s a giant dragon made of stone being attacked by a bunch of vehicles in the middle of a destroyed city as people run in fear. This is a pretty good way to grab the audience’s attention, if you ask me. How did we get here? What are these things? Why should we care? 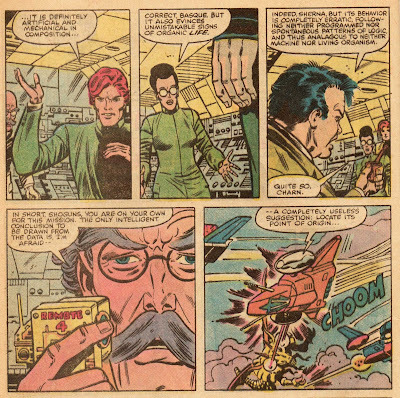 Luckily, writer Doug Moench heeded the clarion cry of Stan Lee and understood that every comic has the possibility of being someone’s first. 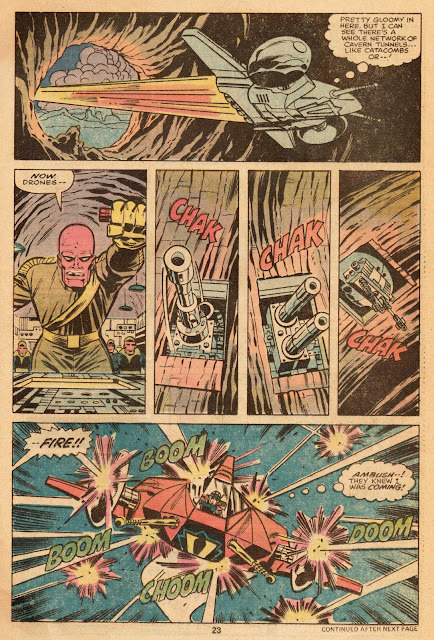 Moench quickly does some backstory work. 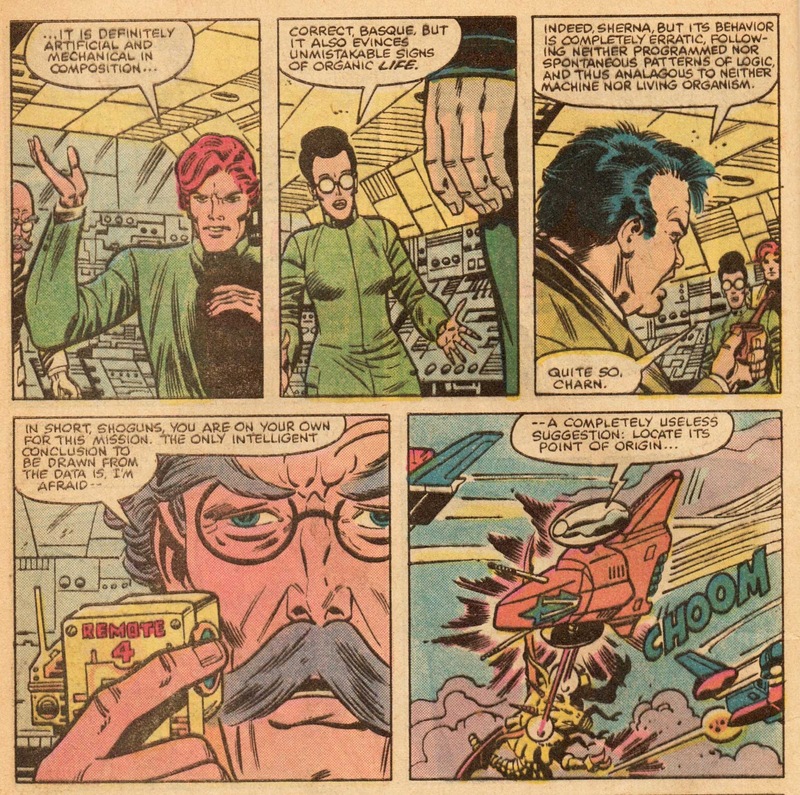 Apparently Lt. Magar is a renegade Agent of Evil and hates science. By using his sorcery, he ends up creating a hybrid science/sorcery creature known aptly as Mech-Monster (the big stone dragon from the previous page). 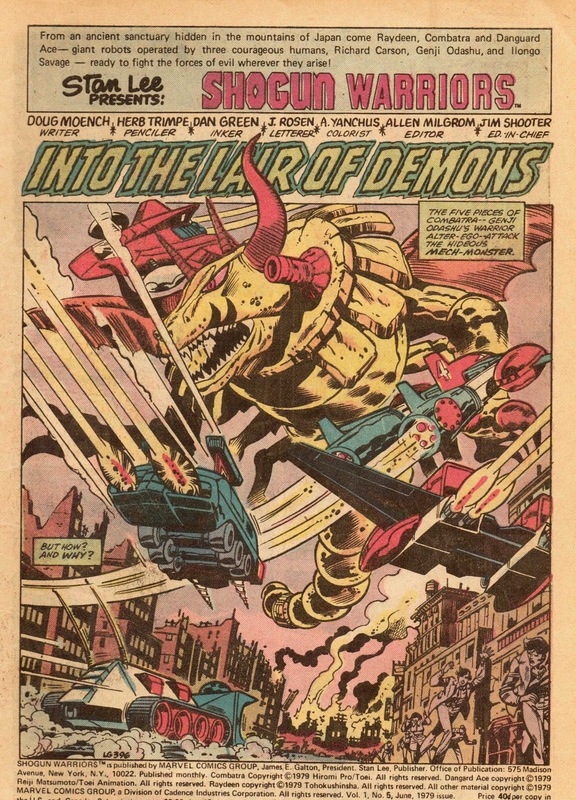 Mech-Monster attacks the city of Metrox, and Combatra, piloted by Genji Odashu (the Shogun Warriors need to be piloted, it seems), flies in to stop it. And we come to the present in the comic. Confused? Don’t be, because none of this really matters in the long run. 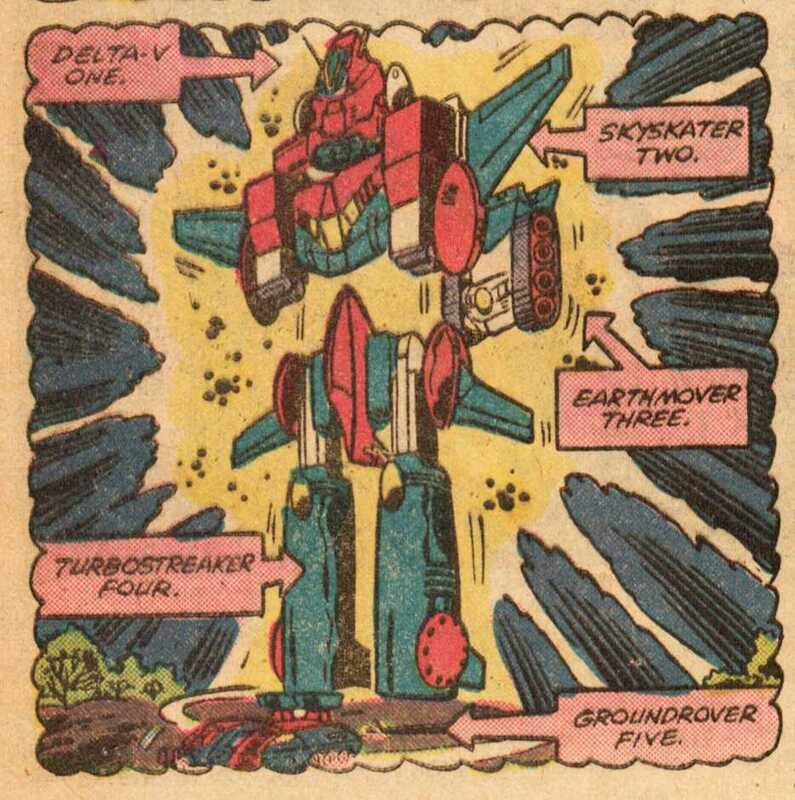 There are giant robots battling and blowing stuff up. Plot is really secondary to this scenario. Gaah! That’s creepy, especially when you start to think about the fact that there is a robot operating a robot. Why they had to add an extra layer of robot to the mix is a bit confusing. Couldn’t control of the 1st layer of robot be done by computer? But once again, giant robots – blowing up stuff – plot not important. 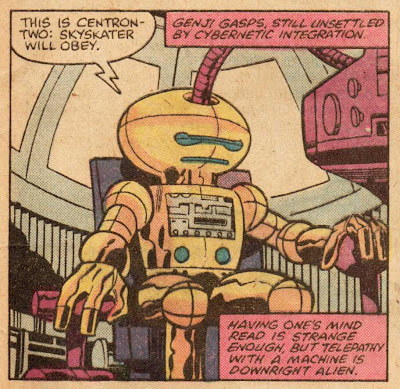 Genji Odashu and Combatra can’t seem to make any headway in blowing up Mech-Monster, so she calls for more giant robot backup in the form of Raydeen (piloted by Richard Carson) and Dangard Ace (piloted by Ilongo Savage). Before the other giant robots can get there, though, the giant robot team checks in with Dr. Tambura and “the followers” for some background on how to blow up Mech-Monster. Dr. Tambura and “the followers” aren’t much help though. They can only provide a “completely useless suggestion.” Personally, I would have told the giant robot team that they should probably emphasize the blowing up angle in their fighting, but that’s me. Raydeen and Dangard Ace finally show up and join Combatra in trying to blow up Mech-Monster, but it doesn’t seem to be working. Richard Carson has an idea, though. I love the technical terms in this panel, especially “presto-change-o conversion”. So what is Richard Carson going to have Raydeen do with the television tower he just destroyed? Oh yea! Parks are made for PEOPLE! While this act doesn’t really fall into the “blow up” category, the fact that a giant robot is hitting a dragon made of stone with a huge hunk of metal still ranks it high on the awesome meter! Mech-Monster doesn’t take kindly to this act and flies off. Richard Carson and Ilongo Savage start off after Mech-Monster, but Genji Odashu decides that the best way to win this battle is to follow Dr. Tambura’s completely useless suggestion and trace the source of the monster. She and Combatra fly off on their own, headed towards “the haunt of Maur-Kon and his Followers of Darkness.” I assume these are other “followers” then the ones hooked up with Dr. Tambura. I also assume that Maur-Kon is the bad guy. But once again – giant robots blowing up stuff -- plot is unnecessary. There’s a whole bunch of words between Maur-Kon and Lt. Magar that has nothing to do with blowing stuff up. Genji Odashu lands Combatra on the volcanic island that is Maur-Kon’s hideout. The only way in for her is too narrow for all of Combatra to fit, so Genji pilots Combatra’s head (Delta-V One) into the entrance, leaving “the rest of Combatra outside.” Little does she know, though, that Lt. Magar has set a trap. Combatra’s head (Delta-V One) crashes and “Genji spills from the cockpit like a rag doll.” Maur-Kon is pleased. What’s up with this face, Trimpe? 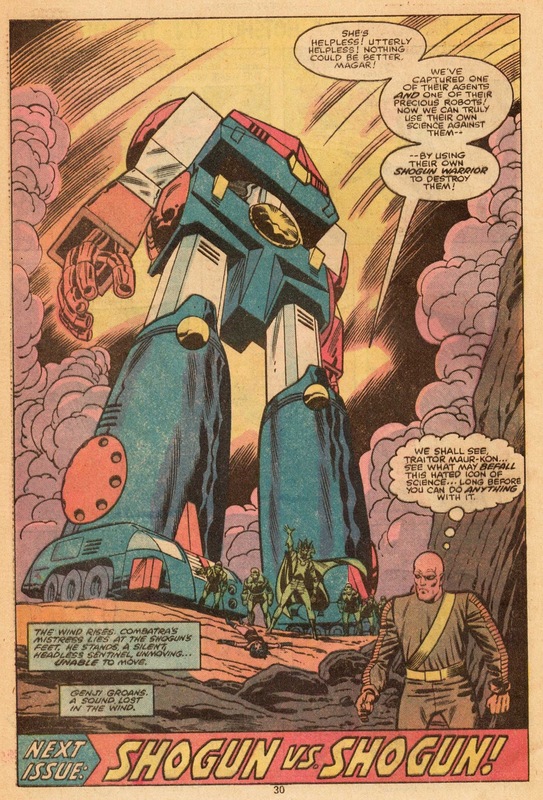 Were you bored with this plot nonsense, too, and wanted to get back to drawing giant robots blowing stuff up? The comic ends with another splash page. There’s a lot of words on this page that I am sure are important to the plot, but they have little to do with giant robots blowing up stuff. What I do see, though, is the teaser line at the bottom which promises more giant robots fighting giant robots (and probably blowing up stuff in the process). This makes me want to go out and find issue number six as quickly as possible. What can I say about this comic that I haven’t already said? It has giant robots fighting and blowing up stuff; how can this possibly be bad? And for only fifty cents? I mean, come on! 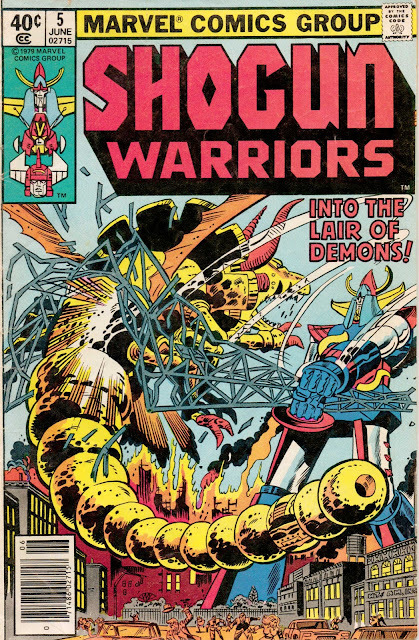 Shogun Warriors #5 was great escapism. Do we need comics which pursue larger themes that address the human condition in a thoughtful manner to make us examine our preconceived notions in a way that could possibly lead to positive change? Sure, of course we do. 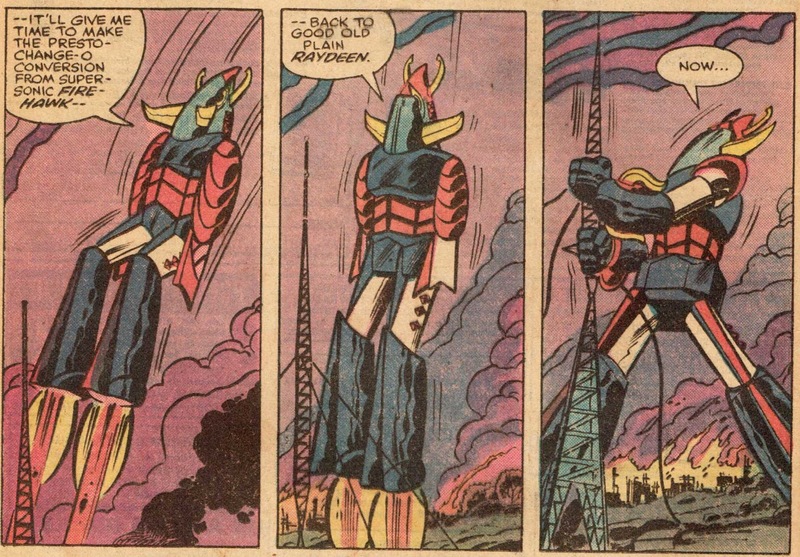 But sometimes, it’s just nice to watch giant robots fight and blow up stuff.